The following pic is taken from a FYROM’s site. The article was written about 2 years ago and it shows explicitly the Irredentist dreams of Skopjans against Greek sovereignty and the anti-Greek feelings promoted in every possible way in FYROM. Notice the flag of FYROM on the top of White Tower in Thessalonike. Mural of 1568 calls Alexander "king of Hellenes"
Skopjan irredentism: one of the latest chapters. To the people from the Republic of Skopje I want to say: go back to school and learn your history and geography lessons. 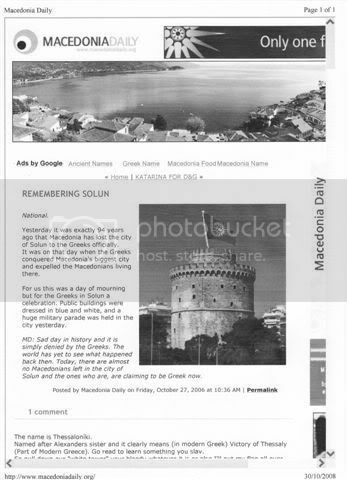 Macedonia always has been Greek, so the city of Thessaloniki has been deliberated by the Greek. According to the locals the name of the Macedonian capital is Thessaloniki.